For part two of the birthday recap, let's focus on the cake. I have to admit, this was the moment I was most excited about when planning for the party. 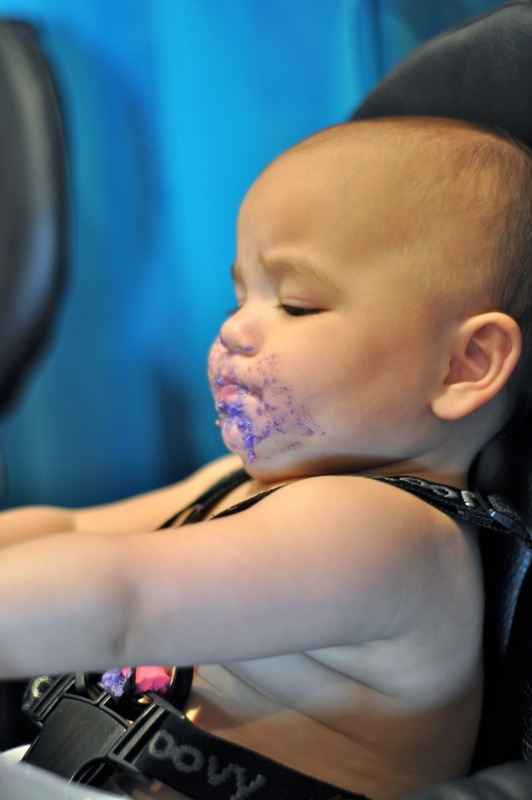 I mean, let's face it...Mommy has the biggest sweet tooth out there. This was going to be the moment of truth...did the girls inherit their Mommy's love of all things sugary? I was dying to find out! 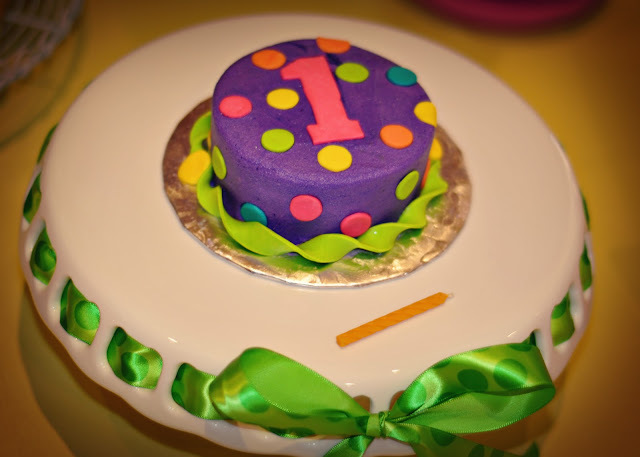 As I mentioned in the first birthday post, Amy Cakes made these darling smash cakes. Like many other of the girls' belongings, the pink one was for Layla and the purple was for Jenna. 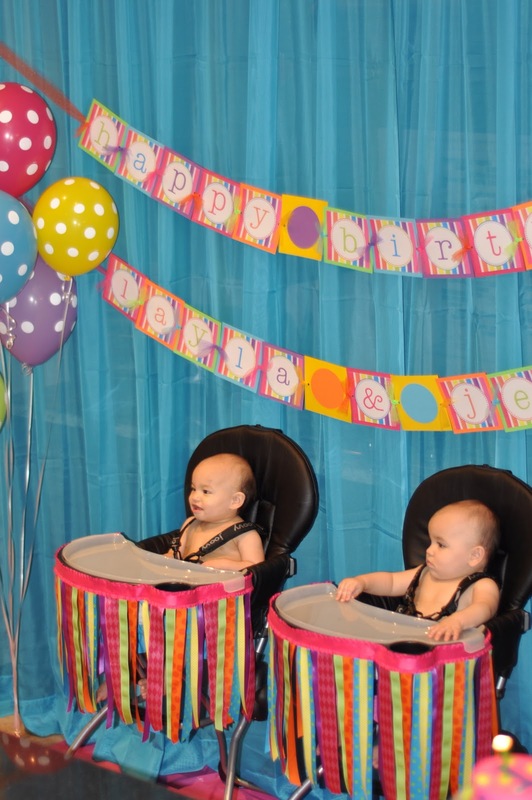 To prepare for the chow-down, Layla and Jenna were pretty certain they needed to put on their birthday suits, but Mommy insisted the diapers stay on! Right before taking these pictures, Jenna fell in the crack between the couch and the cushions, which gave us an idea. 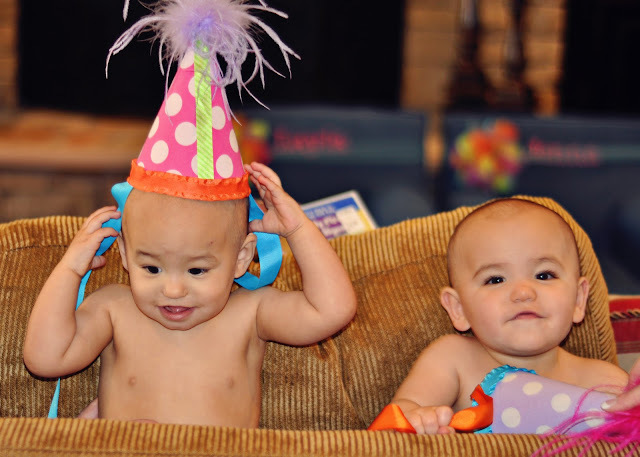 Why not trap the babies in the couch to see if we can get them to wear the birthday hats that they wanted nothing to do with? It didn't work. Layla is totally loving being serenaded as we all sing "Happy Birthday". Jenna is not so sure what's gotten into all of us! Now, for the moment of truth...make a wish, sweet babies (ahem...I mean toddlers)! Layla: "Ooh, I think I like this." Jenna: "I don't know, guys, this doesn't seem like a good decision." Here Jen, let me help you. Layla: "This stuff rocks! You guys should try it!" Layla: "Hey sis, do you get the feeling we're being watched?" Jenna: "Yeah, but just keep eating. Maybe they'll go away." Layla: "I just need a little sip to help wash this down." Jenna: "Alright, I think I'm getting the hang of this." Jenna: "Oh man, it's so good...can't keep it coming fast enough!" Jenna: "I just know these rolls are going to regret this later!" 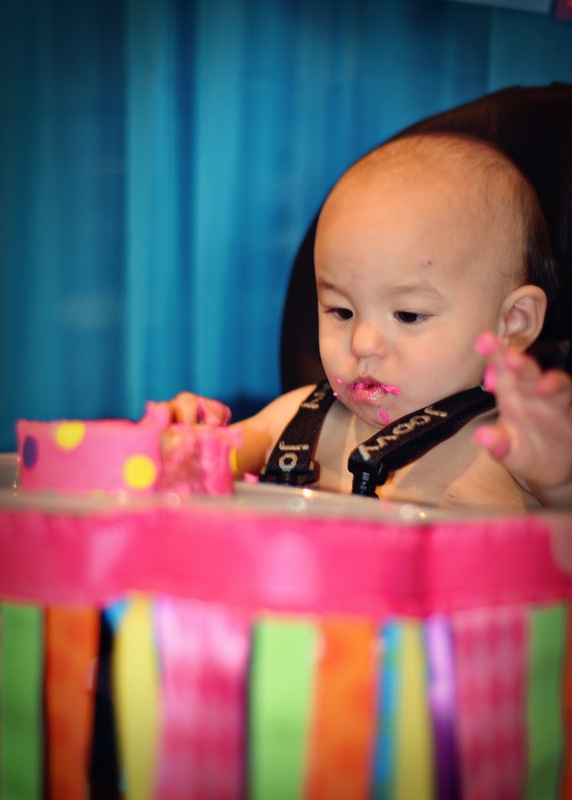 Thanks for sharing, sweet Layla Jane! The aftermath...it could've been worse. 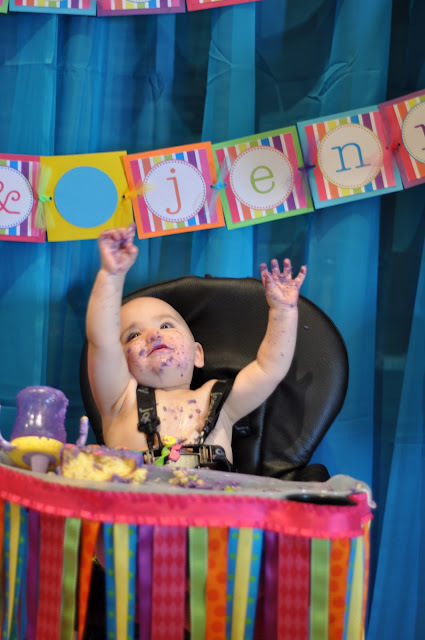 You know it was a successful cake ceremony when baths come immediately after. 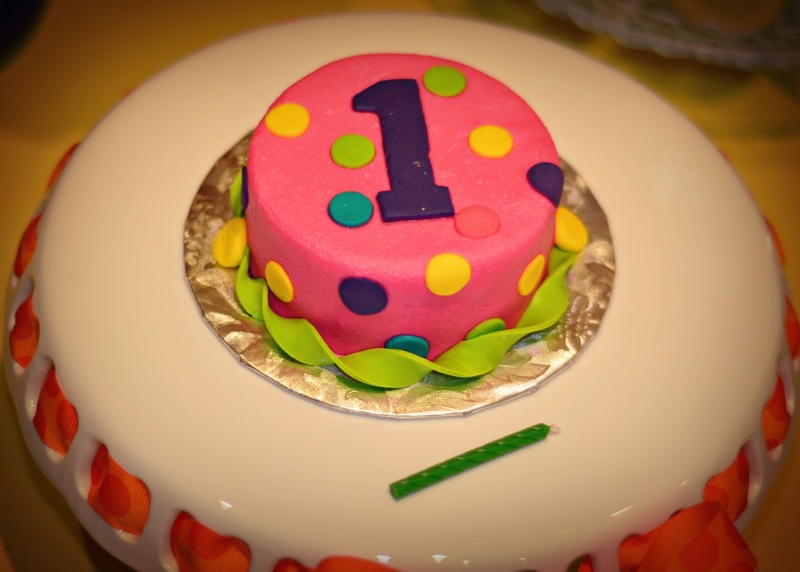 It's been over two weeks now since Layla and Jenna celebrated the big O-N-E and I know I need to record this momentous occasion in our family blog, but to be honest, the task has me a bit overwhelmed. To allow me to focus on the fun stuff during the party, I asked my multi-talented friend, Megn, to take the pictures. That was probably the best decision I made in planning the whole event, but now there are so many awesome images to share I don't even know where to begin! To help me get a handle on this, I've decided to break it up into several smaller posts...hopefully it won't take me too long to get it all documented. The invitations (as well as all the printed pieces) were designed by the gals over at The TomKat Studio. I just love those ladies...they make it so easy! They can do just about anything you want and then send it your way as a PDF. From there you print, cut, paste, and dazzle it up to your heart's desire. 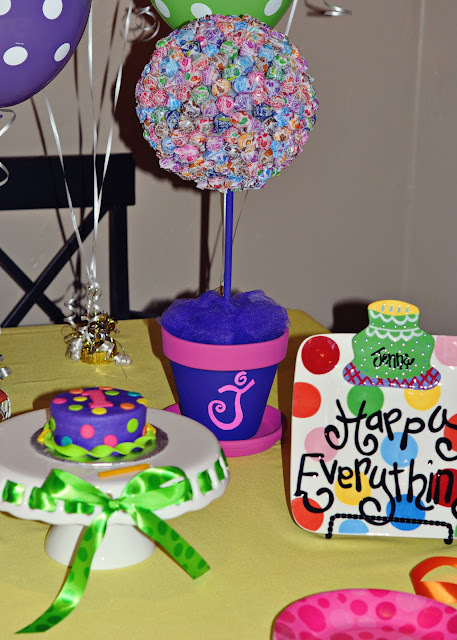 We had a small family party, so lucky for me, I only had to make about 10 of these darlings! We have two doors at the front of our house, so naturally, I needed two different door decs. This first one is a banner from the lisA fRosT studio. Her big, bright banners are a favorite of mine. 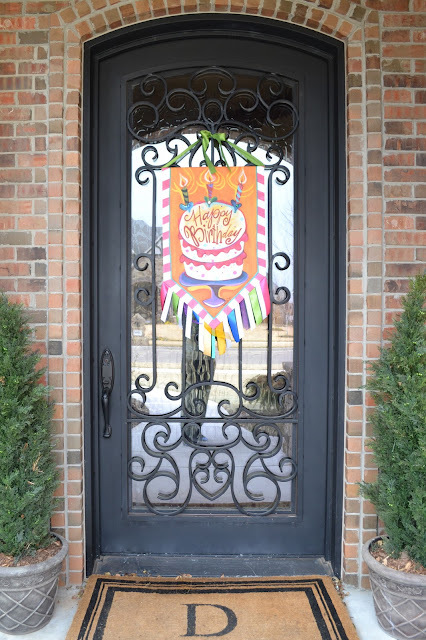 Our front door is quite large and it's sometimes difficult to find something to hang that isn't completely swallowed by the door. Lisa Frost's banners are perfect for our door...I have several of them for different holidays. For the mudroom door, I made a balloon wreath. 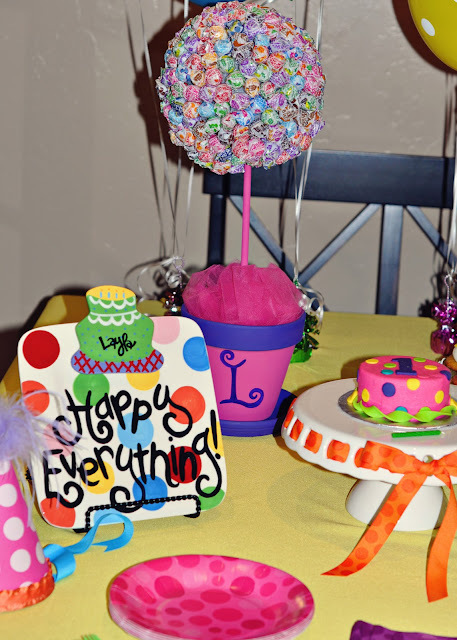 It was so easy and fun to make and you can do any color combination you want. Think of all the possibilities...orange, purple, and black for Halloween...red, white, and blue for Independence Day...red and white for football season. 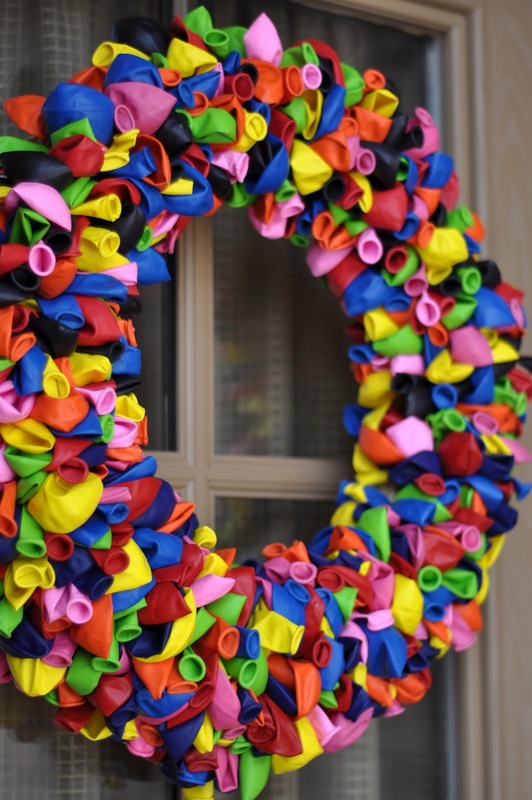 I'm thinking there will be more balloon wreath-making in my near future! Inside, we had a small tablescape for the yummies made by Amy Cakes. If you've ever had the opportunity to sample any of her creations, you know that a party isn't complete without Amy's deliciousness! She is incredible at what she does. Not only does she make the most beautiful cakes I've ever seen (not to mention, the tastiest too), she is so, so sweet and so easy to work with. Check her out on her website or on Facebook to see what she can do...A-MAZING! 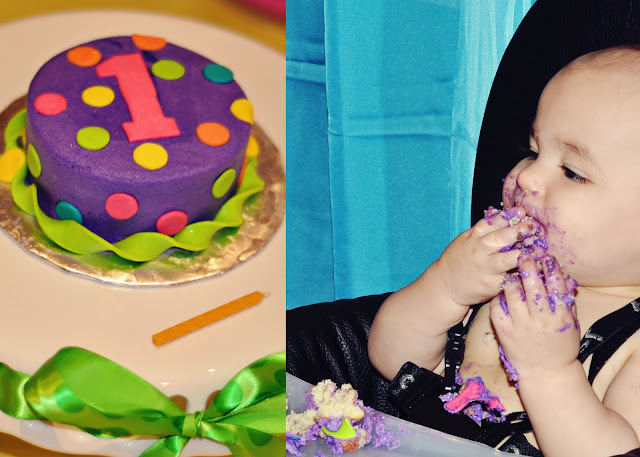 For a child's first birthday, she includes their smash cake as a complimentary gift with your order...how nice is that??? Of course, she made two smash cakes for us! I made the dum-dum topiaries as just a little something extra to fill up space. I think they turned out pretty darn cute. Never did I imagine it would take so many dum-dums to cover that tiny, little styrofoam ball...can you guess how many it took? Here's a closer look at the cakes. The cupcakes were strawberry and lemon and the smash cakes were french vanilla. Oh geez, I'm getting hungry just thinking about them! 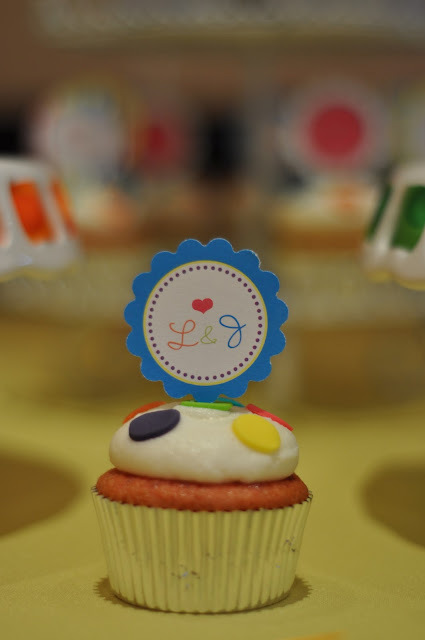 Again the cupcake toppers were designed by TomKat. After meticulous punching with a scalloped puncher and gluing tiny little wooden sticks on the back ...VOILA, the cupcakes are complete! Now, of course, the girls had to have a special place for their cake ceremony. I wasn't really sure what I wanted to do, but I knew I wanted something prettier than my kitchen for a backdrop. I think it turned out fabulous! My favorite part was the ribbon skirt around their highchairs...what an easy way to add color! I actually ended up hot gluing that bad boy on... to this day, I'm still trying to pick off the hot glue remnants! Oh well, totally worth it! 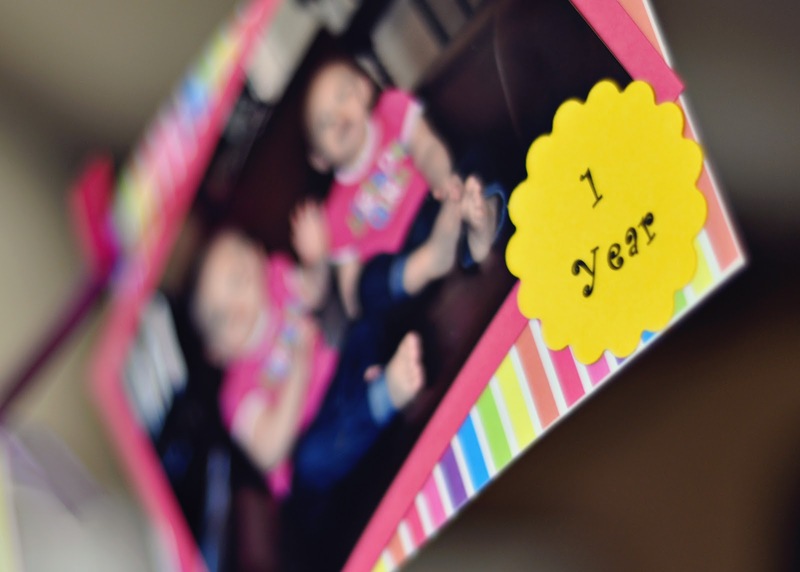 If you're a Facebook friend of mine, you know that I took pictures of the girls on each of their monthly birthdays. I decided to string them all together and hang them for all to see. It was really neat to see how much or how little they changed from month to month. Some of them showed classic expressions that they still make, a few of them were hardly recognizable, but ALL of them were cute, cute, cute! 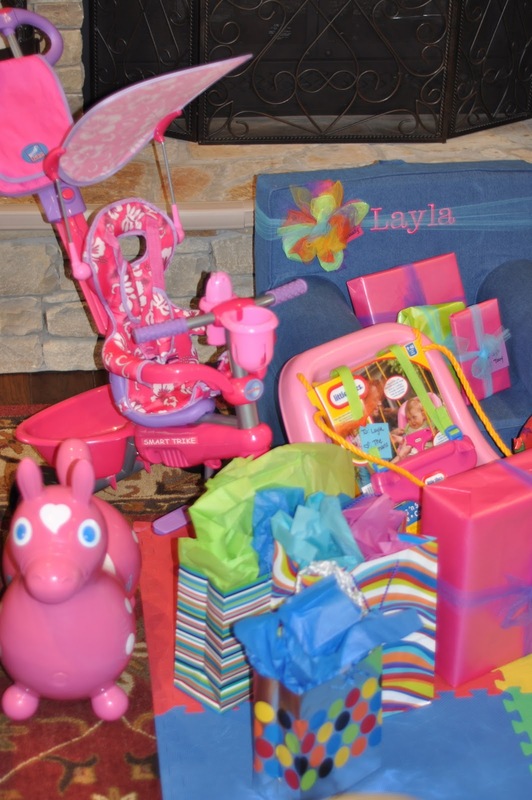 Layla and Jenna were definitely not lacking in the gift department! As Pop would say, they are not spoiled, just well taken care of! The funny part is, this wasn't even all of them. They had 5 or 6 visitors the day before that each brought them a birthday gift as well! Layla and Jenna are VERY well taken care of and VERY grateful to have so many people in their lives that love them to pieces! Of course, a birthday post wouldn't be complete without a picture of the birthday girls themselves! 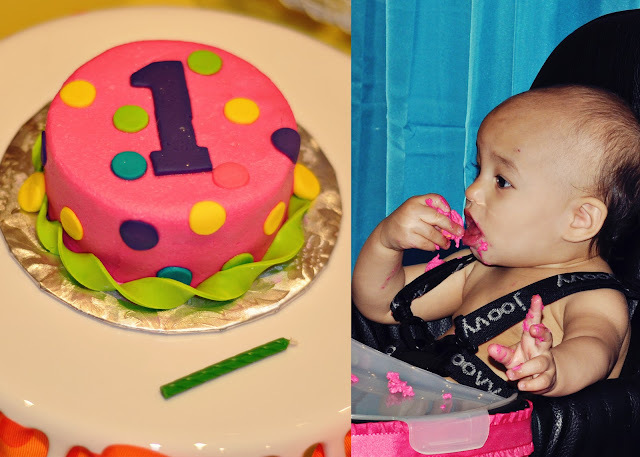 Here they are donning their birthday outfits from Peeka Bootique. If you haven't been to their store in Moore, you must make a trip! You will fall in love and it will most definitely be your one stop shop for personalized holiday outfits. Well, there you have it. This post was all about the details...stay tuned for the scoop on party fun! Oh, by the way, there are almost 300 dum-dums in EACH topiary! The Zoo was a Zoo! 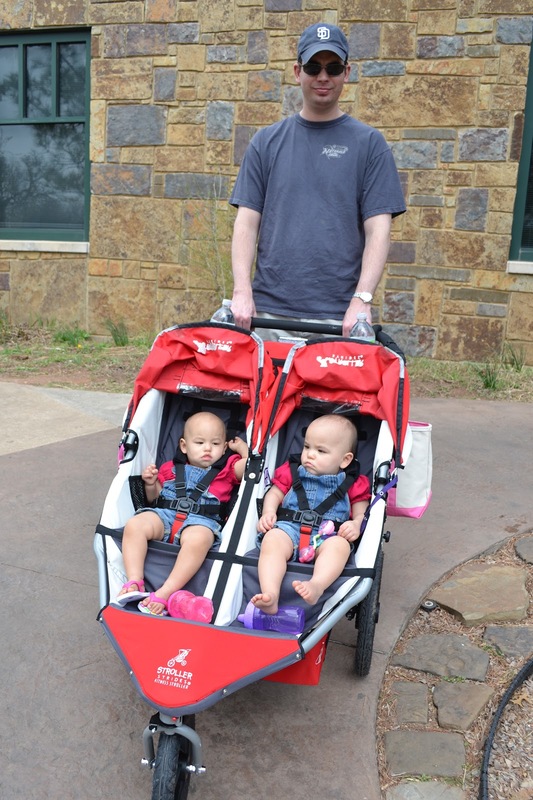 Yesterday, Trey and I decided to load the girls up and head north to the OKC Zoo. 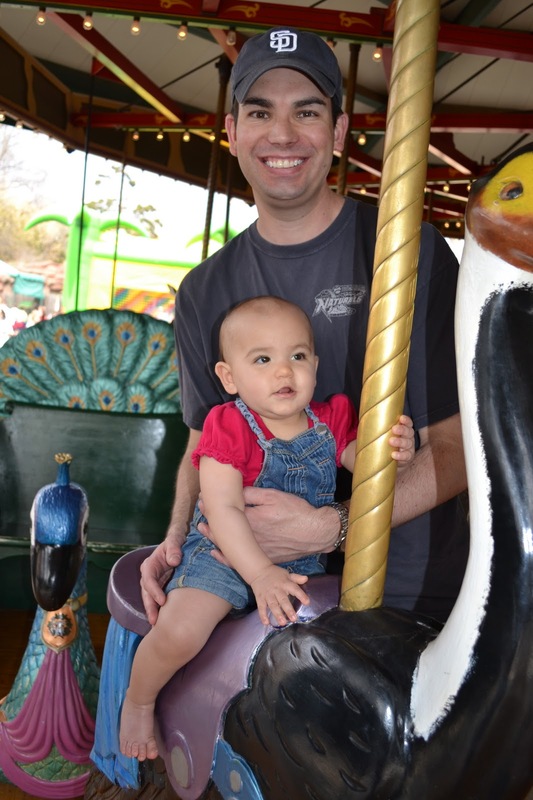 This was Layla and Jenna's first trip to the zoo and boy, was it a zoo! It was way, way crowded, but I guess that's what you get when you venture out on a beautiful, Friday afternoon during Spring Break. If I had to sum up the experience in one word, I guess I would have to say it was fair. We ended up staying an hour and a half, which, in hindsight, was about half an hour too long. Don't get me wrong, the girls had a good time, they were just over it pretty quickly. I think they really enjoyed getting out of their stroller to see things up close and personal, but they did NOT enjoy getting back in their stroller to move on to the next exhibit...who can blame them? Going through the cave into the Children's Zoo. I think Jenna's face reveals how they felt about that! They loved watching the sea lions swim around and bark. I think they could have stayed there for hours. But, their favorite part of all was riding the carousel. I KNOW they could have stayed there for hours! We will definitely be making more trips to the zoo in the near future...just maybe on a not-so-crowded day! 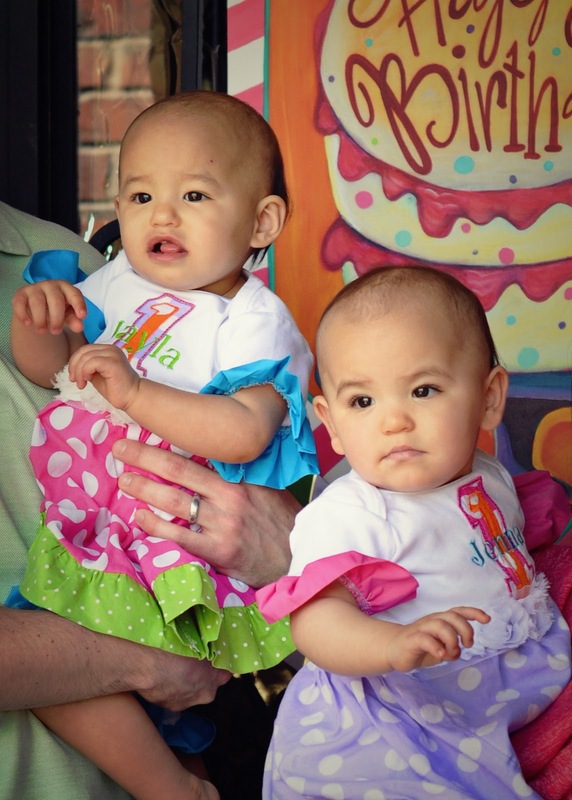 One week ago today, Layla and Jenna celebrated their first birthday! We had so much fun partying it up with our family (more pics to come, I promise) but, now that the girls are all grown up, it was time to make a few changes. I knew the changes were coming and, quite frankly, was terrified. You see, things were going so smoothly around here I could hardly imagine the wrath that would come by messing with their routine. 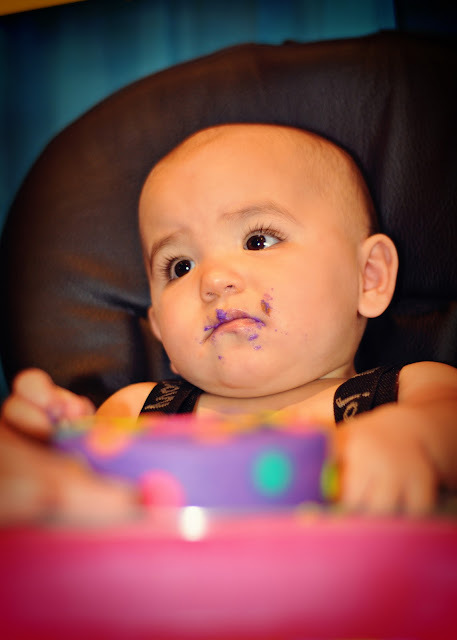 Two of the most dramatic changes were going from a mostly pureed diet to full blown finger foods and transitioning from formula to whole milk, while, perhaps the biggest kicker of all, eliminating drinking from a bottle! Let's just say I wasn't looking forward to this week. Over the last year, these babies of mine have managed to surprise me everyday and this week was no different. Were they a little thrown off by the changes on Monday? Of course! Did they adjust and continue to live happily ever after by Tuesday? You bet! 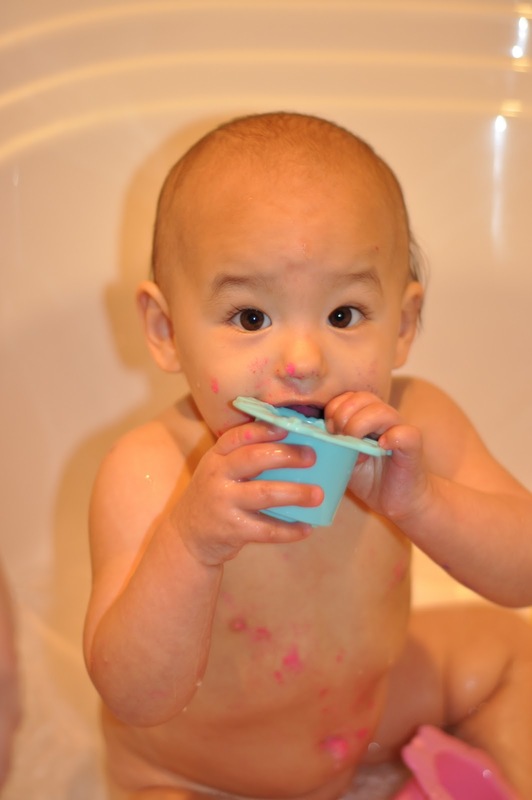 Change can be a hard thing, but after this week, I will always remember the lesson learned from the newest toddlers on the block...change is good (especially if it means no more formula mixing or bottle washing for me)! Enjoying a CUP of milk during movie time. Gobbling up a big girl dinner of spaghetti, broccoli, fruit, and milk.